It’s so big. I mean, really, this car is ridiculously big. It will hold up to 9 people comfortably, and with the roof-rack and the luggage rack that attaches to the back, all their stuff as well. So, it’s perfect for treks to the jungle and back, but it’s not exactly an ideal car for driving in the city. It has a manual transmission. I can drive a stick, but in Quito with the stop-and-go traffic and all the crazy drivers, I would just prefer not to have to. It’s just one more thing to think about. So, for the last year, my husband has been my chauffeur when he’s here, and when he’s not, we usually stick fairly close to home. I try to stock up on groceries before he leaves, but if I do run out of something, there is a well-stocked little store in our neighborhood. There is public transportation here in Quito (in the form of buses and trolley lines), and sometimes I think to myself, “I really should try to learn my way around on the buses and trolleys.” And then I see one, usually packed to the gills, and I remember all the stories I’ve been told about pickpockets and the like. As a gringa, I’m an obvious target in a situation like that. I can’t decide if having my kids with me would make me less of a target (because people might take pity on me) or more of one (because people would assume I was distracted). So, if I need to go across town when Rusty’s away, the other option is to take a cab. Taxis are plentiful and fairly cheap in Latin America, but they are not without their own risks. Every time I take a cab, I’m literally trusting someone I don’t know from Adam to get me (and usually my 3 kids) safely from point A to point B. My kids ride in the taxis without their car seats or even safety belts, since most cabs don’t have them in the back seat. I don’t like that one bit, but it is what it is. In addition, there have been several stories in recent months of people being robbed in a taxi. This usually happens when the person is alone and the cab-driver (who is in league with a gang of thieves) pulls over to let them into the car. They steal your money and then push you out on the street. Rusty actually met a lady from South Africa several months ago who had just been the victim of a taxi-robbery. For some time now, we have been looking to purchase a second car, something smaller and more conducive for city driving, something with an automatic transmission, something that I could drive when Rusty is away. We were having a hard time finding something that we both liked, that fit our budget, and that was also a good, solid car. Buying a used car in a third-world country can be a tricky business. Unless you can buy a vehicle from someone you know and trust and believe took good care of their car, you really just don’t know what you are getting. No Carfax in Ecuador! Then, a couple days ago, we found one, thanks to my sister, who has been scoping out the For Sale boards at Alliance Academy, where she works! The owners are long-time missionaries to Ecuador who recently returned to the U.S. They accepted our offer; our mechanic confirmed that it is a good vehicle; now, all that remains is to arrange the bank transfer. So, perhaps by the end of next week, I will have a car that I can drive! Honestly, up until recently, I was really okay with not driving. Driving is stressful to me under the best conditions — American roads, American drivers, American rules. Quito traffic and the aggressive drivers here really freak me out, and it’s not even as bad as it is in Africa! But lately, I have begun to feel slightly “handicapped” because I don’t drive and sometimes don’t even have a car. So now I (almost) have a car… I guess that means it’s time for me to conquer my fears of driving in a foreign country and get out there in the fray! 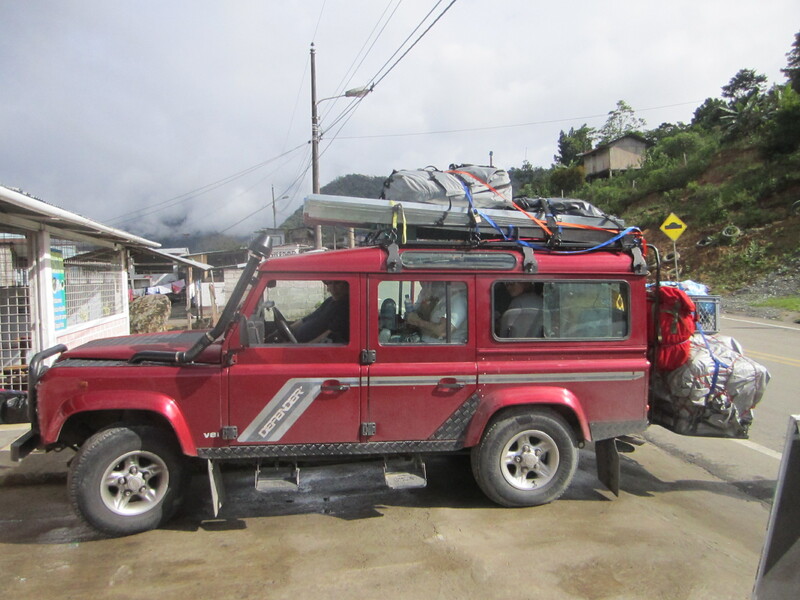 This entry was posted in Ecuador and Her People, Reflections and Ponderings, The Missionary Life and tagged buying a car, driving, Landrover Defender, missionary insights, places we've lived, public transportation, Quito, taxis by lauradcampbell. Bookmark the permalink.